By Eulala PegramMost of us have heard that ARGO won the 2012 Academy Award for Best Picture. It tells the story of what became known as The Hostage Crisis in Iran in 1979. What most of us do not know is that one of those prisoners held for 444 days under what is described as horrible conditions was a Kiowa Indian named Rick Kupke. According to various news sources, Rick spent 21 years in the U.S. Foreign Services. Just before his capture in Iran, he was assigned to the U.S. Embassy in Teheran as a communication specialist and was the last American to surrender during that attack when he was caught carrying the shotguns and rifles to the roof of the Embassy. He was one of 52 Americans captured. Rick has stories of how he and the other hostages tried to pass time in their maximum security prison by playing tricks on each other and inventing games. During their captivity, they suffered lack of food and bathroom facilities, they were moved many times, experienced mock execution ploys, and torture. Other prisoners were beaten, placed in solitary confinement, endured interrogations lasting up to 12 hours, and he and two other were forced to play Russian Roulette several times. In spite of his past experiences, since then Rick has become a popular speaker about his service to his country, his detention as well as his accomplishments. 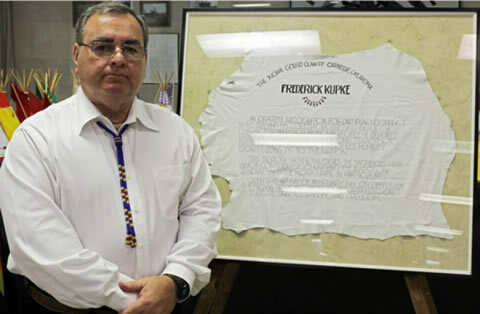 In a recent article in his tribal newspaper, he spoke about his lifelong pride of being Kiowa and how all his life it has always remained his goal to conduct himself in a manner that would reflect favorably on the Kiowa people.Comment: I didn't know about Kupke. Eulala Pegram told me about this article after I mentioned I had just watched Argo. Incidentally, I'd say Argo deserved the Oscar for Best Picture over Lincoln. Rob's rating: 8.5 of 10. For more on the Kiowa, see Codetalker Congressional Gold Medals and Kiowa Libertarian Seeks Office.